Blizzard has recently included another round of updates to the incoming and impressive looking World of Warcraft Cataclysm patch 4.1 that appear to have the intended effect of changing a clear dichotomy that exists in the World of Azeroth. Among the 4.1 patch’s many quality of game life improvements come many, much needed improvements to the Player versus Player facet of the game. In addition to increasing the honor gained from open world kills and battleground participation come a host of new changes that strongly indicate Blizzards’ desire to fuse what have been up to this point in the 7 year old game, two distinct and often incompatible play styles. Blizzard has crafted the World of Warcraft with a clear line of demarcation between those that enjoy PvP encounters and other players that prefer to only fight scripted and predictable PvE type engagements and the Irvine based development team has been reluctant in the past to blur that line in any way… until now. With patch 4.1, justice points (PvE currency) and honor points (PvP currency) will be convertible, both ways, at a conversion rate of 75%. This means that any player with 375 points of one currency can convert that into 250 points of the other. While we love this added flexibility, we cannot help but notice the impact that this philosophical shift may have upon the game moving forward. History may look back at patch 4.1 as the start of a dedicated movement by the Blizzard creative team to erase the distinction of what have been two very dissimilar play mechanics and now that we can finally stop wasting resources on keeping the lines drawn and the mechanics distinct, it is time to start asking the relevant questions such as; how long until we can remove resilience altogether? 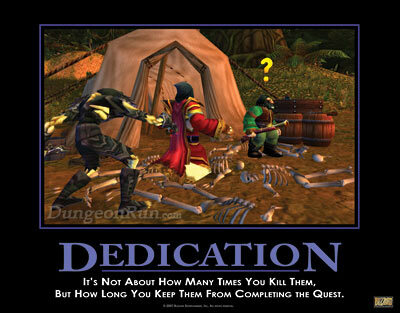 This entry was posted on April 8, 2011 at 11:57 pm and is filed under HFL, MMO, PvP, World of Warcraft. You can follow any responses to this entry through the RSS 2.0 feed. You can leave a response, or trackback from your own site.